More Gardening Tips, and Thinking Ahead! With consistently warmer weather at hand, our gardens are a flurry of activity. Bees and other pollinators are active, and many songbirds greet us with their chorus. Napa Valley gardens will soon begin their most productive period, so now is a good time to review a few basics to ensure your success. 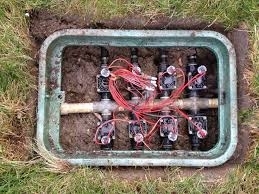 If you have not already done so, check your irrigation system. Young plants will fail without adequate water, so make it a priority to check timers, irrigation lines and emitters. Keep ahead of weeds and pests. Mulching with cloth, straw or wood chips can help reduce water use and weed growth. 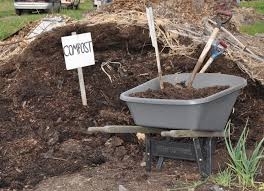 If you don't have one, designate a compost area for clippings and spent plants. Tomatoes, peppers, eggplants and squash are all heat-loving vegetables to plant now. Check local nurseries for unusual varieties. And if your summer garden is humming along, it's not too early to think about fall. Start seeds for cool-weather crops like broccoli in midsummer to ensure that seedlings are hardy and ready to plant in late summer. Thinking ahead allows you to plan for crop rotation and to order rare or unusual cultivars from a favorite catalog. Deadhead roses to encourage them to bloom again; vigorous growers may need some summer pruning. Check container plants to make sure they're getting enough water on hot days; containers can dry out quickly. 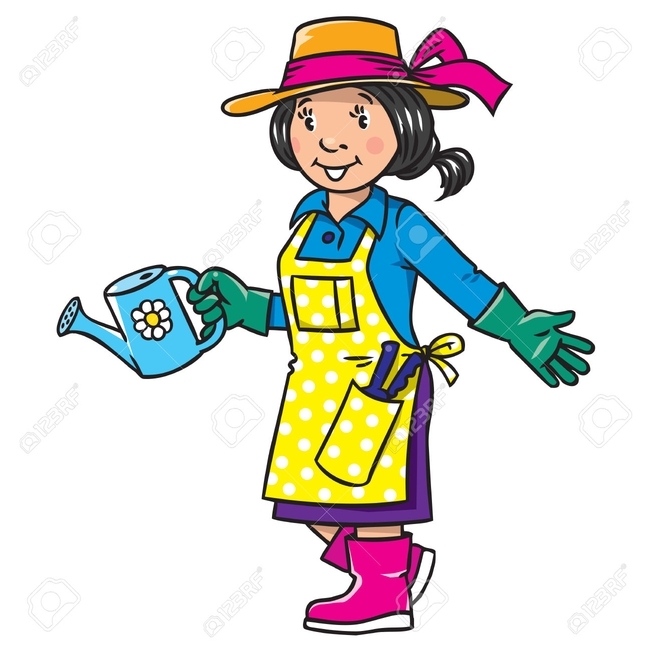 Keep your garden clean and tidy. 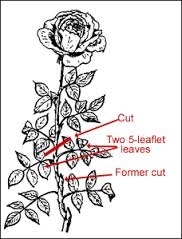 By picking up and discarding diseased leaves, like rose leaves with blackspot, you can keep disease from spreading. Sanitizing equipment and practicing crop rotation will also help keep your garden healthy. While plants are growing rapidly, it's a good time to check on their fertilizer needs. Make safety in the garden part of your everyday mindset. Safety goggles, gloves and closed-toed shoes offer an extra level of safety against accidents and unforeseen occurrences. If you use pesticides, review the labels to prevent poisoning humans, pets and the environment. If you have children in your garden, educate them about safe practices, too. Keep garden tools sharp and in good working order. 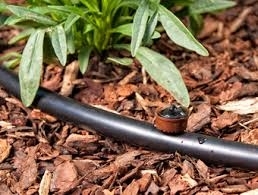 Sharp tools make garden jobs easier and alleviate fatigue. Before using electric tools, check cords for fraying or other safety issues. Also, make sure to use the correct tool for the job. Injuries are more likely when a tool is not meant for the task. Working in the garden can be a relaxing and refreshing experience, but on warm days, be sure to stay hydrated. Protect your skin with sunscreen. A wide-brimmed hat and light-colored clothing can also help prevent sunburn. Even better, take frequent breaks and plan your garden activities in the cool mornings or late afternoon. Also on the safety checklist: use proper lifting techniques and wear adequate hearing protection when necessary. As the summer season winds down, prepare for next year by saving seeds from the vegetables that performed best. (Save seeds from non-hybrids only; seeds from hybrids will not come true.) Consider letting some of your vegetables plants flower to support pollinators and beneficial insects. Compost unwanted plant material. Store tools properly when not in use. 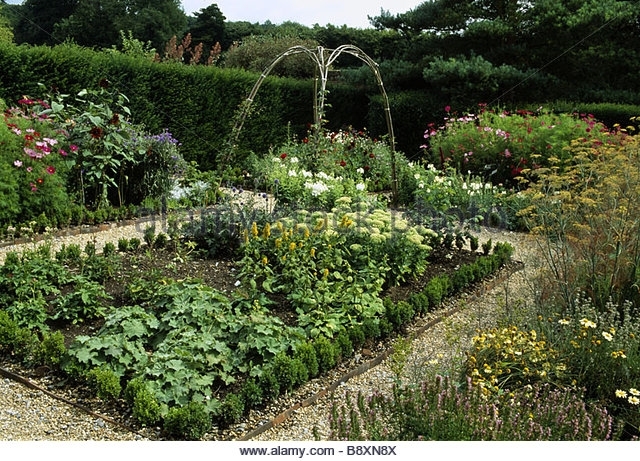 By taking a comprehensive approach to summer gardening, you can look forward to a bountiful harvest. Workshop: U. C. Master Gardeners of Napa County will hold a workshop on “Rose Care” on Saturday, June 3, from 10 a.m. to noon, at University of California Cooperative Extension, 1710 Soscol Avenue, Napa. The first spring blooms have faded, and many roses are beginning to show stress in the form of black spot, rust, mildew and aphid infestation. U.C. research-based help is at hand. Bring your questions. Online registration (credit card only); Mail-in registration (check only or drop off cash payment). Suddenly it feels like winter. Well, not really, but the mornings are definitely brisk now and the days have cooled off. We've had a smidgen of rain. Plants have stopped blooming. What are the butterflies and bees to do? Any poor bees and butterflies still in my garden will have to look elsewhere for nectar. But I want to fix this problem so that, next fall, I will still have some blooms for my pollen-loving friends. I fear the drought is not behind us, so I have been looking at seeds for drought-tolerant native plants that continue blooming into fall. Native plants and our native bees, butterflies and other fauna evolved together and have adapted to our winter rains and dry summers. My water comes from a well, and because I can't see what is going on down there, I am very frugal with it. Bees and butterflies like flowers with flat heads that make it easy to gather nectar. Sunflowers are a good example. 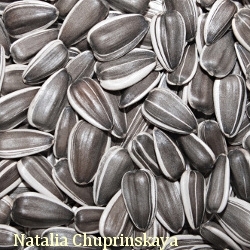 My plan is to scatter their seeds in different areas of my garden after a rain and stomp them into the ground. Then, I hope, they will not blow away and the birds will not find them before they have a chance to sprout. However, I have noticed that those cute little quail that I have invited to live in my yard are eating the tops off of some tender plants, so I will have to use floating row cover to protect the seedlings. After reading about the nectar plants that bees and butterflies favor, I have gathered seeds for tansy, wild senna, meadow rue, yarrow, bee balm, prairie blazing star and sea holly. Some of these are annuals and may reseed if I just let the seeds drop. I also plan to increase the amount and varieties of milkweed (Asclepias)I have in the garden. Their flower heads are the shape that most small bees and all butterflies appreciate. And the different types bloom at different times during spring and summer. The native Asclepias speciosa grows tall and blooms in early summer. As its flowers fade and its leaves get tougher, the butterflies move to later-blooming varieties for nectar and egg laying. Asclepias fascicularis (narrow-leaf milkweed) blooms in late July and August. The bees love those flowers, too. Hot Lips sage (Salvia microphylla ‘Hot Lips') is a favorite of bumblebees. I started with a single one-gallon plant when this variety first debuted and now I have four huge plants in my garden. It needs little water and blooms almost all summer. When I visited the arboretum in Dublin, Ireland, last June, I was surprised to see it growing there. I have other salvias, too, but they do not bloom as long as ‘Hot Lips'. 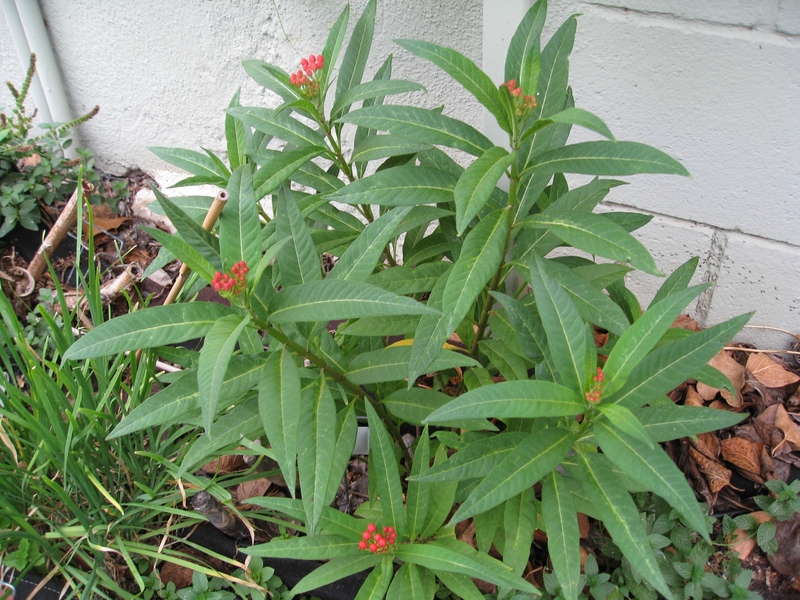 Others have told me that Asclepias curvassiva, a tropical milkweed, has naturalized in some Napa Valley gardens. 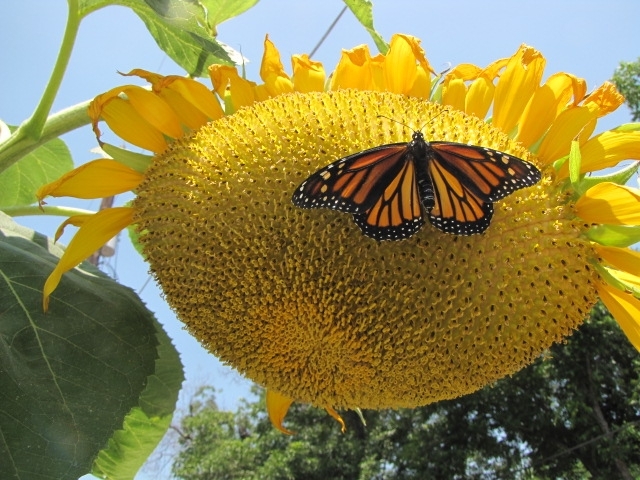 It has also played host to many Monarch butterflies. The plants die down in winter and renew in the spring from self-seeding. Most bees and butterflies like its nectar. Another popular milkweed isAsclepias fruticosa, sometimes called swan milkweed because of the shape of the seed pods. Free Tree Walk: Join U. C. Master Gardeners of Napa County on Saturday, October 22, from 9 a.m. to 11 a.m., for a guided tree walk through the lovely Alameda of Trees at the Yountville Veterans Home. Established in 1884, the Veterans Home has a unique and diverse tree collection. These majestic mature specimen trees are a focal point in the lives of the men and women who live there. Come learn more about these wonderful trees. Meet at the parking lot of the Napa Valley Museum on the Veterans Home grounds, 260 California Drive, Yountville. Not Just -Any- Busy Bee! 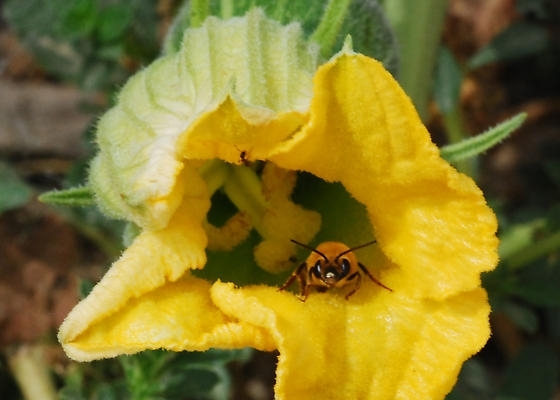 Recently I went into my vegetable garden to visit the squash bees. They come out every year at this time when plants in the Cucurbitaceae family bloom. Cucumbers, melons, squash and pumpkins are just a few of the cucurbits they visit to gather pollen. The males just hang around to breed so that the females can build a nest and lay eggs. Squash bees are among the 1,600 bees native to California and just one of the many types of native bees that visit my garden. The female builds her nest in the ground so be sure to leave some ground bare of mulch or other coverings. Napa County Master Gardeners began studying bees when reports emerged of the declining honeybee population. We learned that some bees like to nest in holes in wood, so several of us built nests out of wood. I made several. The one I made from a piece of log with a little roof on it has done the best. It's a nest for mason bees. I knew the bees were there, but I didn't actually see any until I took the nest to an event for schoolkids at the Napa County Fairground. A bee came out, hung around for a while and then flew away. This was in March when the fruit trees were starting to bloom. About 30 holes were filled in the nest log, each with several bee eggs. A male always hatches first; females follow. I watched the nest log a lot over the next few weeks. The bees had hardly emerged when they began building new nests. Now, once again, 30 holes are filled and the eggs should hatch next spring. Bumblebees have been present in my garden for several years. 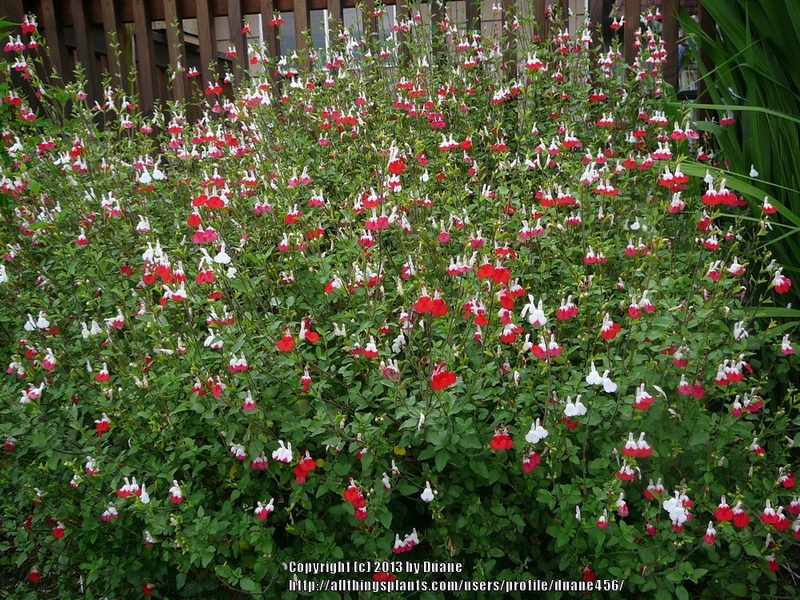 They love my Salvia macrophylla ‘Hot Lips', which is native to Mexico. Sometimes the plant is covered with bees, mostly bumblebees. 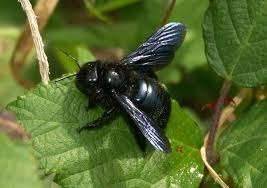 Last spring I learned about the teddy bear bee (Xylocopa varipuncta), a common name for the male Valley carpenter bee. I was working in my garden when a big yellow bee approached me and buzzed slowly back and forth in front of me. He was an attractive bee, so I went inside to research him and identify who was visiting me. I learned that the males have no stinger and can be an inch long. He was definitely the biggest bee I have ever seen. 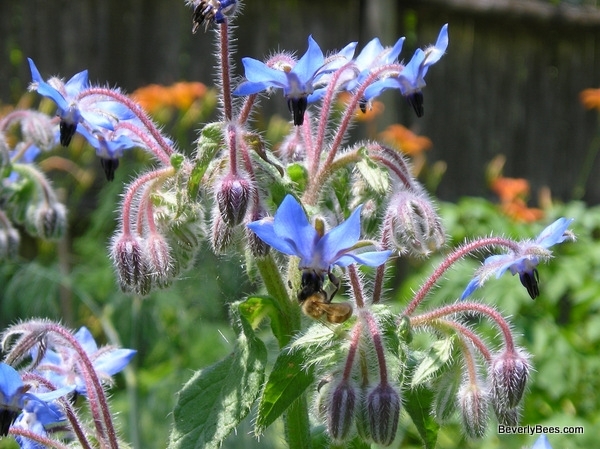 If you want to draw these bees to your garden, plant California native plants. 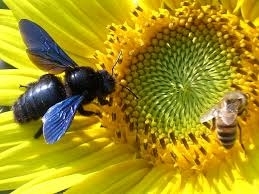 The native bees and plants developed together. Honeybees were imported to this country because they produce honey. However, they have had many health problems over the past years. 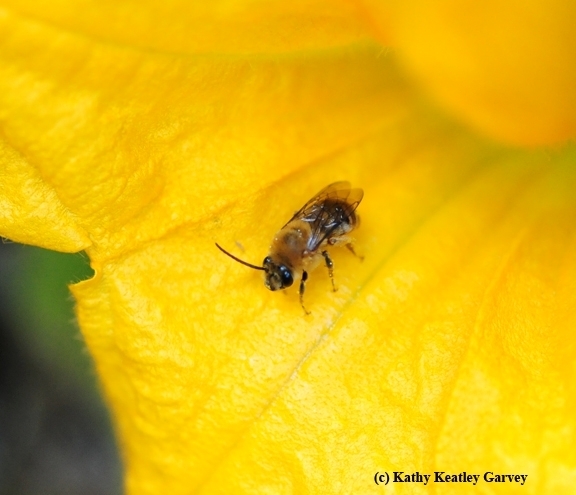 Scientists are studying how native bees might play a bigger role in pollinating crops. About 100 food crops need pollination annually to produce fruit. I even find bees in my garden in winter. I have a clematis that blooms in December and January. When I go out in the cool of the day, I find bees sleeping in the blooms. I never linger long enough to identify which type of bees they are, but I like knowing they are still flying. 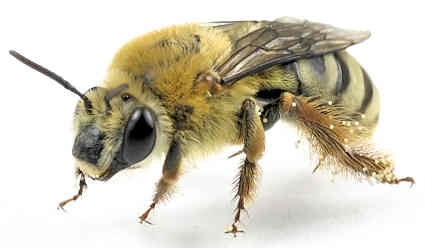 Among the other native bees are digger bees and sweat bees. Some native bees are as tiny as gnats. Seventy percent of bees nest in the ground and the rest in wood holes. At one time, I had many paper wasps building nests in my garden. They were docile around me, and they did gather insects for their nests. One winter a queen wasp overwintered on a door in my shed. I would go in periodically to check on her. She had many small wasps gathered around her, but their numbers kept declining so I often wondered if she ate them to get her through the winter. Eventually she was the only one left in the shed. 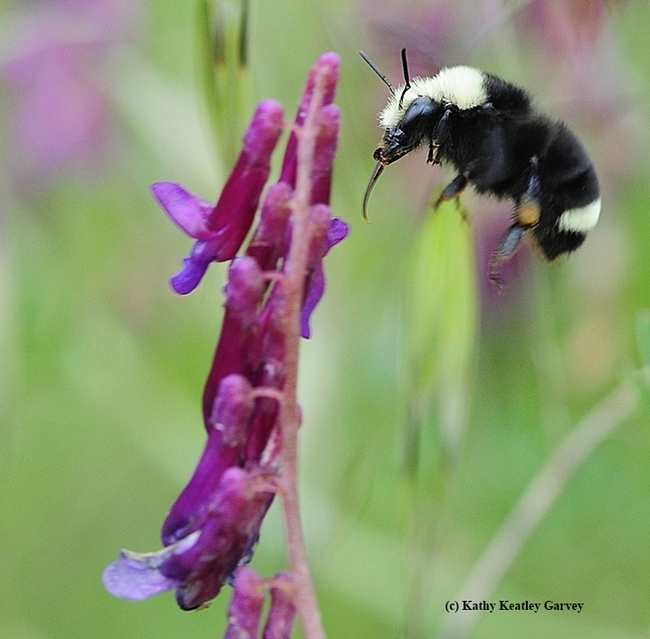 If you would like to learn more about native bees, you can find many resources online. California Bees and Blooms: A Guide for Gardeners and Naturalists by Gordon W. Frankie, Robbin W. Thorp, Rollin E. Coville, and Barbara Ertter is an excellent reference. You can also consult www.helpabee.org. Tree Walk: Join U. C. Master Gardeners of Napa County for a free guided tree walk through Fuller Park in Napa on Monday, August 8, from 10 a.m. to 11:30 a.m. Registration is recommended as space is limited. Meet at Fuller Park, corner of Jefferson and Oak Streets. Online registration or call 707-253-4221. Trees to Know in Napa Valley will be available for $15. Cash or check payable to UC Regents. Sorry, we are unable to process credit cards. Workshop: The U. C. Master Gardeners of Napa County will host a workshop on “Growing Fall and Winter Vegetables” on Saturday, August 13, from 9:30 a.m. to 11:30 a.m., at the University of California Cooperative Extension, 1710 Soscol Avenue, Napa. 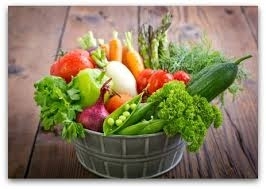 Discover the joy of harvesting vegetables from your own garden in fall, winter and early spring. Topics will include timing, watering, fertilizing, managing pests and harvesting. On-line registration (credit card only). Mail-in/Walk-in registration (cash or check only). The plight of bees and their declining numbers has been in the news in recent months. European honey bees, native bees and other pollinators are affected by habit loss, parasites, pathogens, poor nutrition and pesticide exposure. As avid gardeners,we often choose landscape plants that attract bees and insects, but what if the very plants we purchase contribute to the decline of these garden visitors? If seeds, plants or flowers have recently been treated with neonicotinoid pesticide, these plants may do more harm than good. First developed in the 1980s, neonicotinoids (neonics) are the first new class of broad-spectrum pesticides in over 50 years.Then eonicotinoid group includes imidacloprid, one of the most popular garden insecticides sold in stores. Neonics are widely used in horticulture and agriculture for a variety of pests. Like most powerful insecticides, they affect the insect nervous system; however, neonics themselves are comparatively safe for birds and mammals. A systemic pesticide, neonics are absorbed by the plant and transferred through its vascular system. Consequently, the plant and, to some degree, its nectar and pollen become toxic to insects. The toxin remains active in the plant for weeks and detectable in the soil for years. Untreated plants can absorb these chemicals from treated plants nearby. 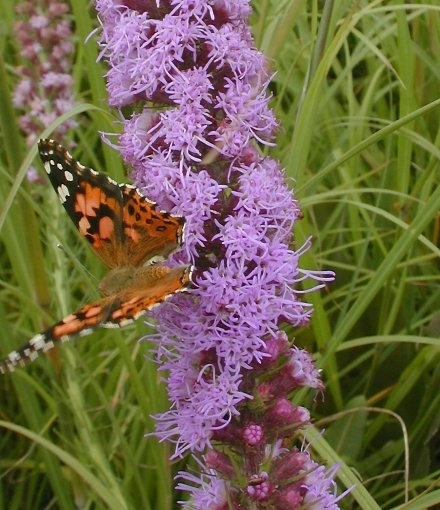 As pollinators feed on these plants, they may be exposed to the pesticide. This exposure can have a variety of effects, depending on dose and sensitivity. Effects on an insect can include disorientation, a weakening of the immune system and death. Even slight exposure to neonicotinoids can affect some bees' ability to navigate or detect odors, impairing their ability to forage for food. While this may seem like it's better than dying, a bee that can't forage effectively may be as good as dead. In 2013, European Union member states voted to prohibit the use of three neonicotinoids—imidacloprid, clothianidin and thiamethoxam on flowering plants and some crops. A mass die-off of bumblebees in Oregon that same year was attributed to a misapplication of neonicotinoids on linden trees. This outcome led Oregon authorities to adopt permanent restrictions on dinotefuran and imidacloprid, both neonics. While neonics have little effect on honeybees, they can have profound effects on native solitary bees and bumblebees. 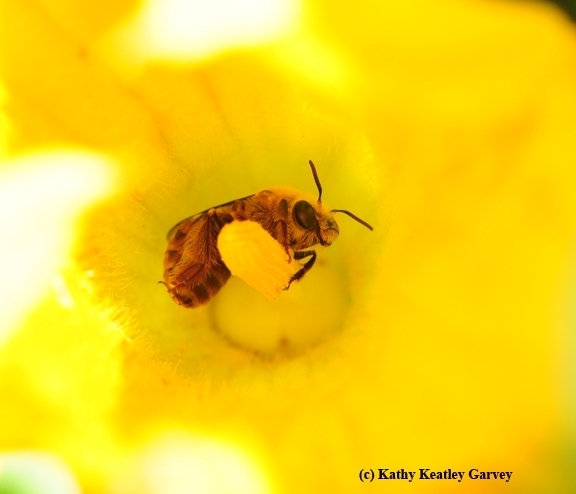 These species don't get the headlines that honeybees do, but they are important pollinators. Many home and garden retailers have already agreed to eliminate neonic-treated plants from their nurseries. 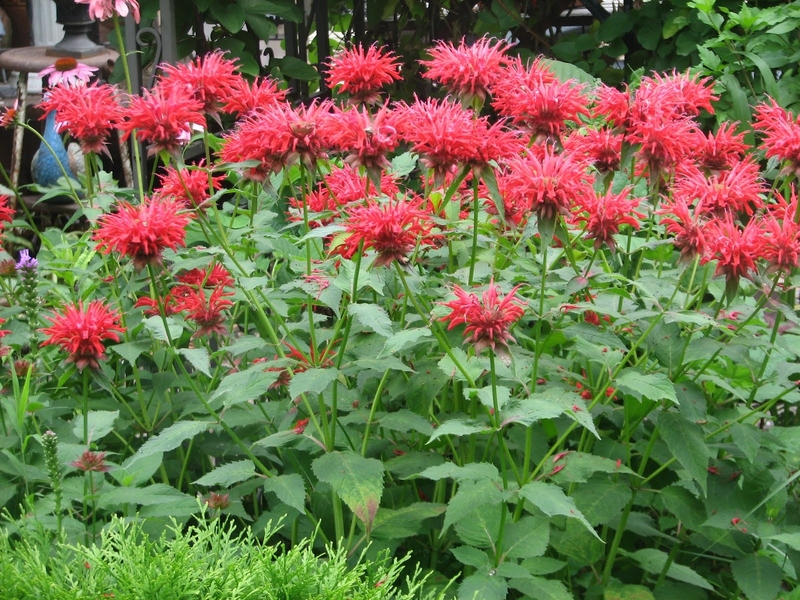 When purchasing a plant that is or soon will be in bloom, look for a tag that states that it is neonic-free. When applying pesticides, read labels carefully. Look for warnings that the pesticide may have adverse effects on pollinators. 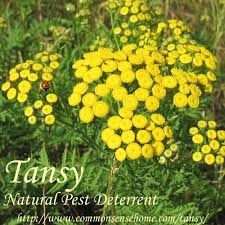 Follow application instructions, both for your own safety and to avoid killing non-target insects such as pollinators. 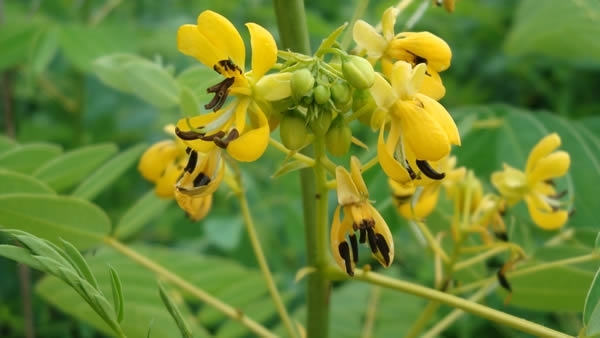 Consider the consequences of using systemic insecticides containing imidacloprid, clothianidin, thiamethoxam, acetamiprid and dinotefuran, especially on blooming plants attractive to bees. Avoid combined fertilizer-insecticide products as many of these contain broad-spectrum insecticides. Use safer products such as horticultural oils or soaps. More importantly,practice Integrated Pest Management techniques to control garden pests.Visit http://www.ipm.ucdavis.edu/ for more information on these methods. Broad-spectrum insecticides are not selective. They can kill beneficial insects like ladybugs as well as other predators and parasites that control pests. That said, neonics don't kill all insects that land on a plant, only insects that eat the plant or its parts. 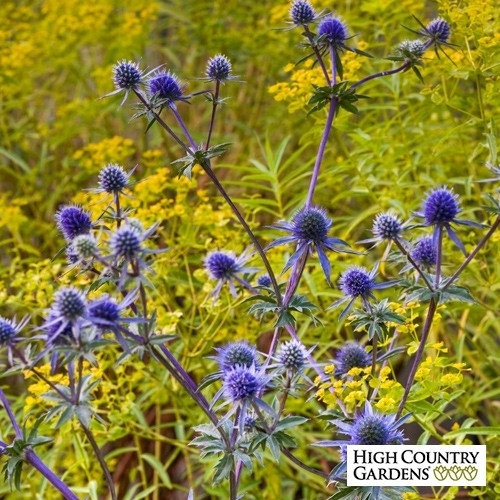 Unfortunately, this can include bees and other beneficial insects if the plant is, or soon will be, in flower and attractive to bees. On plants that are wind pollinated, such as oaks and grasses, this is less of a concern. Bees and other pollinators pollinate 70 percent of the world's flowering plants, and more than 30 percent of the plants that produce food. As informed gardeners, we have choices. We can purchase safe garden plants and flowers and limit our use of neonics. Creating pollinator-friendly gardens as a food source for beneficial insects is one step to protecting all bees and pollinators. Workshop: U. C. Master Gardeners of Napa County will host a workshop on “Fruit Tree Pruning and Care” on Saturday, January 16, from 9:30 a.m. to 2 p.m. The workshop includes a lecture session from 9:30 a.m. to 11:30 a.m. at the University of California Cooperative Extension office, 1710 Soscol Avenue, Napa. A hands-on session at a local orchard follows, rain or shine, from 12:30 p.m. to 2 p.m. Please dress for outside weather. On-line registration (credit card only); Mail-in/Walk-in registration (cash or check only). How do you know you don't like a food unless you've tried it? That question can apply to adults as well as children. I made it through decades without eating kale. It's not that I actively avoided the vegetable; I just never elected to eat it. When the Napa County Master Gardeners decided to field-test kale last year, I decided it was finally time try some. Kale comes in many shapes, sizes, colors and textures, and catalogs offer a huge selection of seed. When you growing plants from seed, you have a wider selection than what the nurseries or “big-box” stores typically carry. What's more, some of the vegetable varieties that the nursery trade grows are chosen for their ability to withstand handling, transport and display, not necessarily for their taste. Kale is a fast-growing source of greens during our cool season. Most kales are extremely winter hardy and become sweeter with frost. Harvest can continue through winter in Napa County. Kale can be eaten raw in salads or cooked for a side dish, pasta or soup. Many of the colored varieties, including some that we grew in our trial, make attractive ornamental plants. 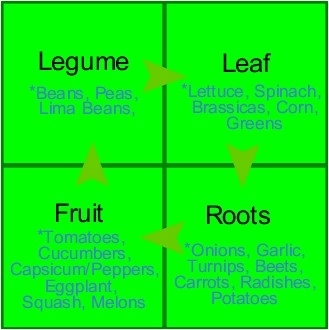 Harvest leaves from the outside so that the plant can continue to push new leaves from the center. As the plants mature and you remove more outside leaves, the plants can start to look like miniature trees with foliage on top of a long stem. The field-test committee grew three varieties of kale last fall, all strikingly different.We evaluated each type for productivity, vigor and health, and for flavor and texture, both cooked and uncooked. All three types had high germination rates, ranging from 87 percent to 91 percent. One variety we grew was 'Nero di Toscana,' a popular type often seen in grocery stores. This Italian heirloom has strap-like leaves about 3 inches and 10 to 18 inches long. It is familiarly known as dinosaur kale because of its crinkly texture. We also tested 'Red Ursa' kale, a Russian variety. 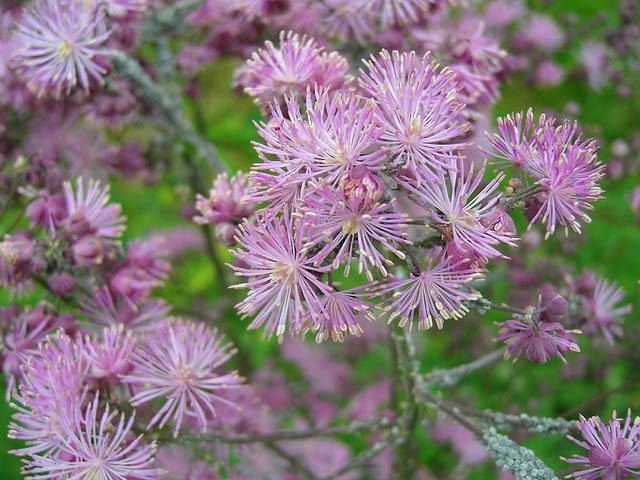 It grows into a gorgeous plant with a fountain of big frilly leaves with purple veins and stems. 'Dwarf Blue Curled Scotch' was our third selection. 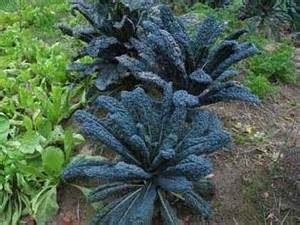 It is a low-growing, spreading, early kale with tightly curled, blue-green leaves, beautiful enough to be grown solely as an ornamental. The other two varieties rated higher in most categories, but no single variety was the unanimous favorite. Some field testers found 'Blue Curled Scotch' harder to clean because of its curly leaves, and chewier and stronger in flavor. Others thought 'Red Ursa' was the prettiest and easy to use in cooking and salads. 'Nero di Toscana' generated the most enthusiastic comments and was voted most likely to be planted again. 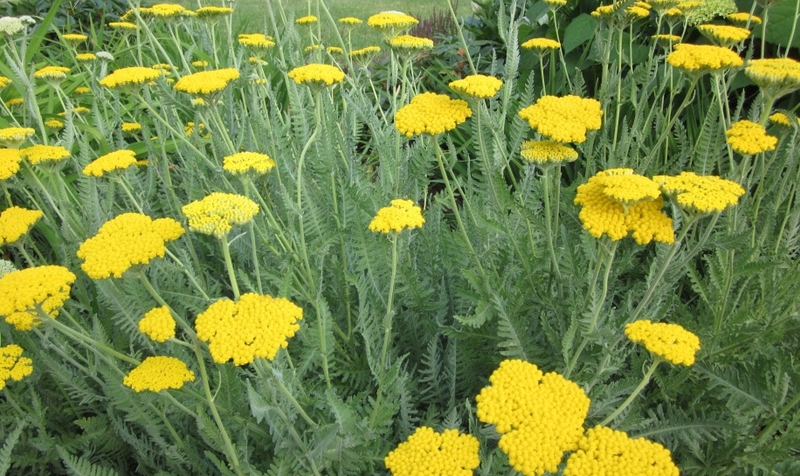 Master Gardeners liked its flavor and found it more tender and productive than the others, although it suffered more damage from cabbage larvae. Row covers helped keep bird damage to a minimum. Other pests that can damage kale include slugs and snails, cutworms, flea beetles, cabbage-root maggots and aphids. A majority of testers said that they would grow kale again. There was a lot of enthusiasm and recipe-swapping at our meetings, with kale featured in everything from soup to chips to smoothies. Many especially enjoyed kale raw in salads. Testers appreciated that the plants produced for a long time if they harvested only outside leaves. 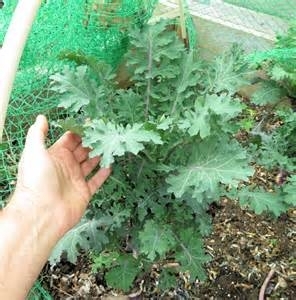 You can plant kale seed directly in the ground from the third week of July until mid-August. Protect young seedlings from insect damage by using row cover. You can also start kale indoors and set out transplants from the third week of August through mid-September. 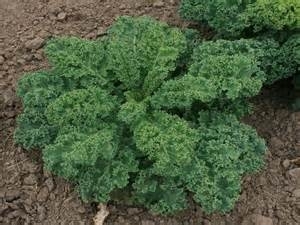 Kale likes full sun but can benefit from light shade during hot weather. It prefers consistent moisture but can tolerate drought, although the flavor will suffer. Cool weather slows the damage from pests, making kale easier to grow. To minimize disease, avoid planting kale or other cabbage-family crops in the same location more than once every three to four years. Seed remains viable for up to four years. Garden Tour: The Master Gardeners of Napa County invite you to attend their sixth garden tour, “Down the Garden Path,” on Sunday, September 13. On this self-guided educational tour, you will see seven gardens owned by Master Gardeners in and around the City of Napa. These gardens illustrate how Napa County Master Gardeners use University of California research-based horticultural information to develop and maintain their own gardens. Tickets: $30 advance / $35 day of event. Purchase tickets here - http://bit.ly/1fqLJZe. Or you can purchase tickets at the Master Gardener office (address below). For more information, call 707-253-4143.